Some things in life just go perfectly together. Ham and cheese. Gin and tonic. Sam and Frodo. And animals and Snapchat. Check out our recent post about cats on Snapchat to see what we mean. Need more proof? 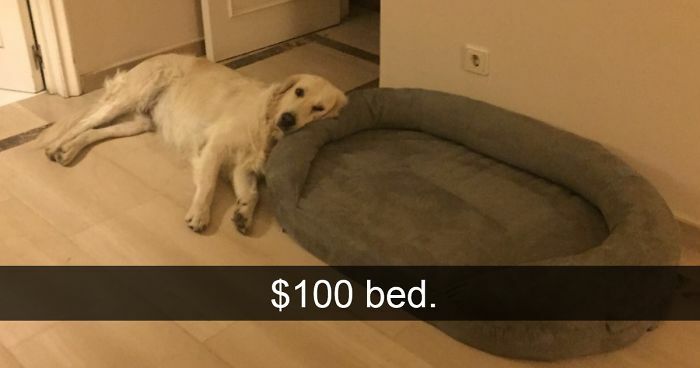 Then scroll down for some hilarious Snapchats about dogs in this list compiled by Bored Panda. From parrots riding on bulldogs and dogs in bras to crazy canines trying to drown each other in the toilet, you're sure to laugh whether you're a dog lover or not. Don't forget to vote for the funniest! Must be a foldable dog, folded in the wrong direction. "Beth, I swear! Its not what it looks like..."
LOVE this one! So obvious which one is like..."Really? I wasn't enough for you?" Having lived with a dog all my life, I can say it's probably too hot to lie down in at the moment. Which is why I ALWAYS give my dog the last bite of my food. I wouldn't have it any other way. Very impressive :D His face is like "Whoohoo I am the King of the Wall. Strong, undefeated! Aaand I need to go down. Any help hooman? ...Yeah sure, take the picture first, I can wait... -_-"
is he related to scooby doo? It's experiencing the Doggler Effect. LOL! Any sleeping pics anybody has taken of me in my life ALL turn out like this! Ugly/strange sleep face! LOL! This dog is incredibly tiny. Make it stop! I don't wanna get old! S'rously, like that's going to happen. This dog has seen things. This picture reminds me of my chow mixes, who would think they'd died and gone to heaven if it snowed this much. They have long, thick double-coats. The colder it is outside, the happier they are and don't want to go inside where we thin-skinned wimps have the heater cranked up. I'm not the droid you're looking for! What did you do to offend him? Did you tell him off for something? My dogs beg to go for a walk and about 5 minutes in this is them. Lmao. We're neutering the hooman right? Ruby. My yard looks like Omaha Beach after the invasion! Am I the only one that can't get past the vast array of nail polish? ...on the bananaphone, listening to your antics. Lol those things off gremlins? The first stage before they fed them. Truth in advertising, for once.